Special shoe insoles designed to prevent costly and common stumbles and tumbles among the elderly will be available in Australia by year-end. 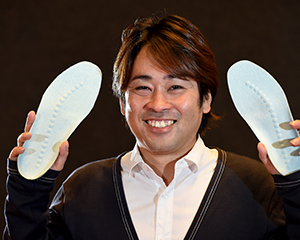 Victoria University researcher Dr Hanatsu Nagano developed the insoles as part of his PhD over nearly a decade after two of his grandparents in Japan suffered debilitating falls. Worldwide, one-in-three elderly people experience injurious falls annually, but the problem is particularly serious in Japan where one-quarter of the population, or 35 million people, are over 65. “I wanted to make a social contribution to this very big problem by offering a product that is affordable, and can be easily made and used,” he said. Dr Hanatsu Nagano and supervisor Dr Rezaul Begg with the insoles Dr Nagano designed. The insoles are designed with a series of raised bumps that follow a foot’s ideal centre of pressure to help with side-to-side balance, a shock-absorbing contoured heel, and a forefront that helps increase minimum toe clearance – the reason for many trips and falls. They will sell in Australia in pharmacies and speciality shoe stores as part of an integrated shoe made partly from traditional Japanese textiles for roughly $170. Human trials with partner University of Tsukuba in Japan have proved the insoles dramatically reduce falls among the elderly, as well as with tripping-prone hospital patients suffering from conditions such as dementia, osteoarthritis, or knee surgery. Over a recent six-month trial, Dr Nagano found nearly 40 elderly people wearing the insoles did not fall at all. And only one of 12 insole-wearing hospital patients suffered a fall over a four-month period compared to three falls for a control group of a similar size who were not wearing them. Dr Nagano estimates that his invention could save 36.5 billion Yen (or close to AUD$500 million) in direct medical costs in Japan for every one per cent decrease in incidents of trips and falls. While only 15 per cent of Australians or about 3.5 million people are currently aged 65 or older, that proportion is forecast to rise to 25 per cent by 2050, the same as Japan. Dr Nagano said he initially designed the insoles for the elderly, but he expects to further refine them for other users, including joggers and walkers. Victoria University has an international patent on the injury-reduction insoles. Dr Nagano’s company, Global Bridge, is now working with Japanese fashion manufacturer and retailer, Caitac Family, to commercialise them. Dr Hanatsu Nagano is a postdoctoral research fellow specialising in biomechanics at VU’s Institute for Sport, Exercise and Active Living (ISEAL). 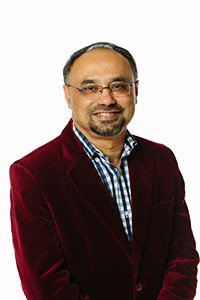 His research supervisor is Professor Rezaul Begg, leader of VU’s assistive technologies research. Both are available for comment. Dr Nagano joined ISEAL as a research fellow in 2013 with the ultimate aim of transferring biomechanical research outputs into the real world to enhance health and quality of life for older adults. He is now a postdoctoral research fellow. His specialties include biomechanical modelling and simulation of the major factors of falls when older adults are walking, (i.e. tripping, slipping and balance loss). Encouraged by his previous experiences in collaboration with various industries, he is keen on developing practical applications based on the fundamental scientific research outcomes. Nagano, H., and Begg, R. “Injury Reduction Insole.” Patent Cooperation Treaty (PCT): WO2016/015091 A1. Nagano, H., and Begg, R. “Injury Reduction Insole.” Australia Provisional Patent: 2014902939. Levinger, P., Nagano, H., Downie, C., Hayes, A., Sanders, K., Cicuttini, F., and Begg, R. 2016. Balance recovery during induced falls is impared in people with knee osteoarthritis: Implications for falls prevention. Osteoarthritis and Cartilage, 24 (1): S92. Nagano, H., Tatsumi, I., Sarashina, E., Sparrow, W.A., and Begg, R.K. 2015. Modelling knee flexion effects on joint power absorption and adduction moment. The Knee, 22 (6): 490-493. Nagano, H., Levinger, P., Downie, C., Hayes, A., and Begg, R.K. 2015. Contribution of Lower Limb Eccentric Work and Different Step Responses to Balance Recovery among Older Adults. Gait and Posture, 42 (3): 257-262. Nagano, H., Sparrow, W.A., and Begg, R.K. 2015. Can Toe-Ground Footwear Margin Alter Swing-Foot Ground Clearance? Gait and Posture, 42 (2): 214-217. Nagano, H., James, L., Sparrow, W.A., and Begg, R.K. 2014. Effects of walking-induced fatigue on gait function and tripping risks in older adults. Journal of NeuroEngineering and Rehabilitation. 11 (105). Nagano, H., Sparrow, W.A., Bowman, R., and Begg, R. 2013. Anti-slip strips for reducing slipping risks during walking. In proceedings of the International Conference on Fall Prevention and Protection, Tokyo, Japan, 23rd-25th October 2013. Nagano, H., Begg, R., and Sparrow, W.A. 2013. Computation method for available response time due to tripping at minimum foot clearance. In proceedings of the35th International Conference of the IEEE Engineering in Medicine and Biology Society (EMBS), IEEE. Osaka, Japan, 3-7 July 2013. Nagano, H., Begg, R., and Sparrow, W.A. 2013. Ageing effects on medio-lateral balance during walking with increased and decreased step width. In proceedings of the35th International Conference of the IEEE Engineering in Medicine and Biology Society (EMBS), IEEE. Osaka, Japan, 3-7 July 2013. Nagano, H., Sparrow, W.A., and Begg, R. 2012. Ageing effects on the mechanical energy cost of walking. In proceedings of the World Congress 2012: medical physics and biomedical engineering. Beijing, China, 26-31 May 2012. 168-171. Nagano, H., Begg, R., and Sparrow, W.A. 2010. Controlling swing foot centre of mass and toe trajectory to minimise tripping risk. In proceedings of the 32ndInternational Conference of the IEEE Engineering in Medicine and Biology Society (EMBS), IEEE. Buenos Ires, Argentina, 31 August-4 September 2010. 4854-4857. Nagano, H., Begg, R., and Sparrow, W.A. 2012. The effect of a slip-resistant floor treatment (anti-slip strip) when walking on an oil contaminated surface with two types of shoes. Technical Report for Global Safe. Nagano, H., Begg, R., and Sparrow, W.A. 2012. The effect of a slip-resistant floor treatment (anti-slip strip) when walking on an oil contaminated surface with two types of shoes. Technical Report for ASICS Oceania. Professor Begg's main fields of research include Biomechanics, Biomedical Engineering and Machine Learning. Prior to commencing at Victoria University, he worked at Deakin University, the University of Aberdeen and BUET. At Victoria University, he leads a multidisciplinary team of 15 researchers including postgraduates and postdoctoral fellows. His work focusses on developing new technologies and techniques with applications to human gait pathologies. These techniques have been utilised to minimize balance-loss and falls which can result from tripping or slipping across a range of populations. Applications of sensor technologies and biofeedback techniques to gait problem diagnosis. Interventions to improve gait function in older adults and patients with stroke or diabetic neuropathy. Assistive technologies for enhancing physical and physiological performance. Prof. Begg is a senior member of the IEEE professional society, IEEE Engineering in Medicine and Biology Society (EMBS), and IEEE Computational Intelligence Society (CIS). He has contributed to organizing over 20 international conferences. Professor Begg has published 70 journal articles, 1 research monograph, 4 edited books, 17 book chapters, 105 refereed conference full papers, 36 conference abstracts and 3 technical reports. Wahid MF, Begg RK, Webster K, McClelland J, Halgamuge S, Ackland DA (2016). A Multiple Regression Normalization Approach to Evaluation of Gait in Total Knee in Total Knee Arthroplasty Patients. Clinical Biomechanics, 32: 92–101. Khandoker A, Sparrow WA, Begg RK (2016). Tone Entropy Analysis of Augmented Information Effects on Toe-Ground Clearance When Walking. IEEE Transactions on Neural Systems and Rehabilitation Engineering, published online 1/4/2016. Ewing K, Begg RK, Galea M, Lee P (2016). The Effects of Prophylactic Knee Bracing on Lower-limb Kinematics, Kinetics, and Energetics during Double-leg Drop Landing at Two Heights. The American Journal of Sports Medicine, 44(7):1753-1761. Santhiranayagam B, Lai D, Sparrow WA, Begg RK (2015). A Machine Learning Approach to Estimate Minimum Toe Clearance using Inertial Measurement Units. Journal of Biomechanics, 48 (16): 4309-4316. Nagano H, Sparrow WA, Begg RK (2015). Can Toe-Ground Footwear Margin Alter Swing-Foot Ground Clearance? Gait and Posture, 42(2): 214–217.